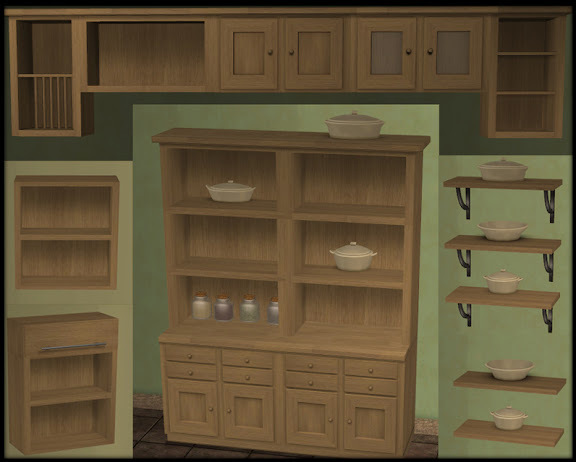 Three small cupboards, a middle section that works well with KitchenBasic too and three shelves that you can make invisible and use as OMSPs. 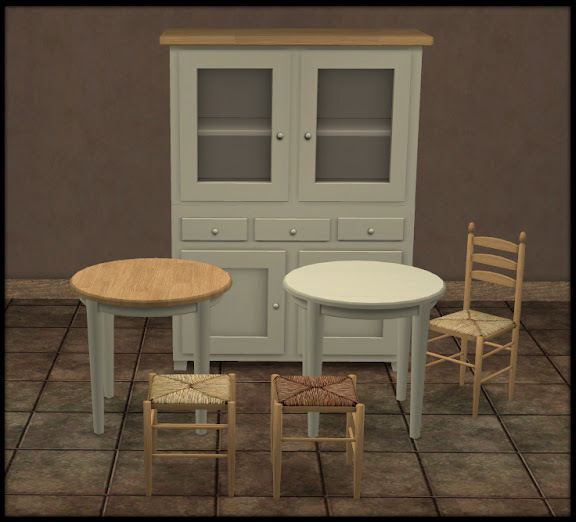 4 dining pieces: a cabinet, a stool and a round dining table X 2 in order to be able to use all colour options. You can keep both or delete the one you don't want. The stool is slaved to the dining chair and KitchenBasic Bar Stool 1 and you get a couple more cushion cover choices. 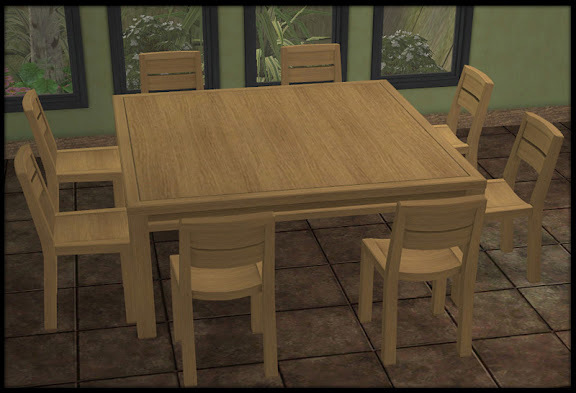 Large 2X2 versions of both the Shakerlicious and the Plain and Simple dining tables. Perfect for big families. Thanks to Numenor for the template. You're things are so beautiful~ works of art, really. Once again you amaze and dazzle with your skill and creativity. Thank you so much for more stuff for my fave kitchen, Natalie!!! omg, this is gorgeous!! just when you think this set couldn't possible get any more awesome! Absolutely beautiful!! 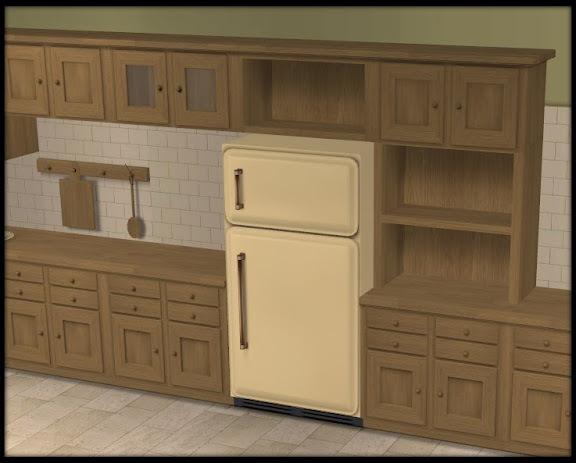 I just love this whole kitchen set!! Thanks so much! fantastic! Thank you so much Natalie, you are really one of the best meshers around. Awesome! Thank you so much! Lovely things as always from you! May I worship you a little? Thank you very much for all the new kitchen goodies! thank you for the amazing add-ons! never enough of them, I totally love this kitchen! My jaw literally dropped when I saw this update. 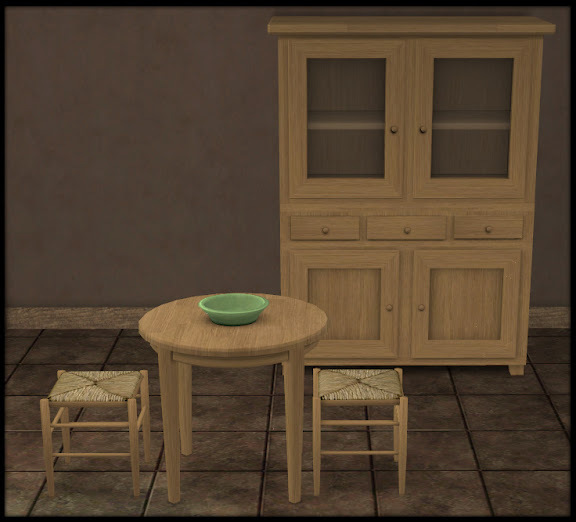 Thank you SO much, I love this kitchen and these add-ons make it even more fabulous! I thought this set was was awesome before, but you just keep adding more and more great items to it. Thank you so much, I don't think I will ever quit abusing this set. This amazing set just became even more fabulous!Thanks so much for these great new pieces! 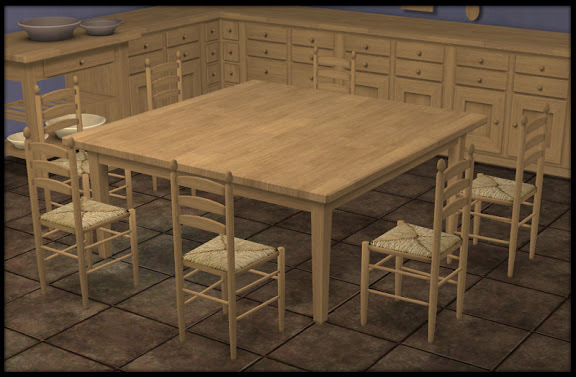 Thank you - I'm so glad you're still making new meshes for TS2. Not only is your work gorgeous aesthetically, but the quality is outstanding! Its stunning! Thank you SO much!! Wow, thank you for this stunning updates! This kitchen is my big favorite. The KitchenBasic and Shakerlicous are my favorites. Thank you so much for adding to them!! Beautiful work! This is my favorite kitchen and I love the extra stuff you made :) Thank you! Thank you so much. I love this set. Big hug! Fantastic additions to the best kitchens ever! Thank you! I've died and gone to Sims 2 Heaven! Wow! ! ! Everything's "s p e c t a c u l a r". Thank you so very very much for sharing all this terrific, wonderful sets. These are all so beautiful. I believe I have downloaded everything you have made now. Thank you! How do you install this into the game? Your creations are AWESOME. Does the Fridge in Part one come with that or is that seperate?? And if it is separate, where can I get it??? In order to use anything in this set you need the original Shakerlicious Kitchen Set and the fridge is included in that. Thank you - this is really nice. Oh my God, you are amazing! 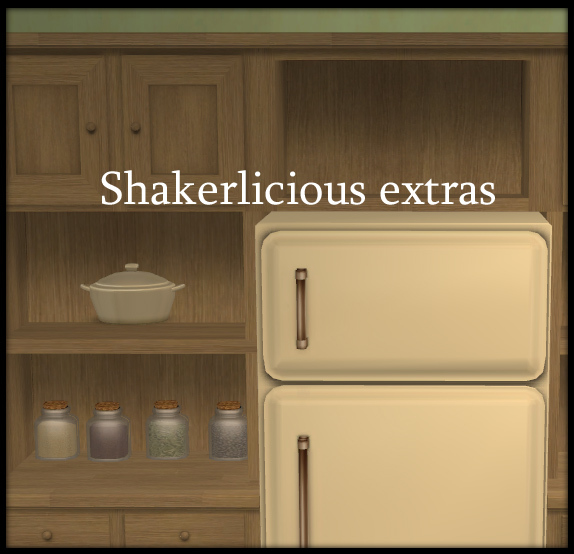 I have all the Kitchen Basic stuff and Shakerlicious and I use them in almost all of my houses. I just have one question: How do you put stuff on the shelves? Like you have in the pictures? Your work is simply stunning. Every time I create a new house, I have to use your set or it's just not a home. Thank you very, very much; you are an artist and a very good one. i have the same question, how do you put things on the shelves? Hi Buggybooz, I think I ran into a problem with your Shakerlicious high chair. I looked at the package and yes there is a dirty state but for some reason there was a mispelling so that it wasn't linking correctly. I have fixed it and will upload it shortly. I love your kitchen, its my absolutly favorit! And i can´t stop furnituring my simshouses with your shakerlicious and basic kitchen! thank you for these very big and fantastic creation! Seriously, you just smashed shakerlicious, I love love it! !